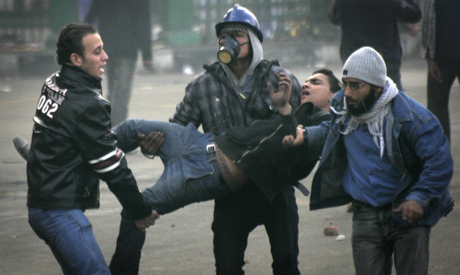 Health ministry reports nine deaths and around 344 injuries since the bebinning of military attack on protesters sitting in at Cabinet headquarters in Cairo in the early hours of Friday morning. Prime Minister Kamal El-Ganzouri, recently appointed by Egypt's ruling Supreme Council of the Armed Forces is addressing the nation in response to the violence. He defends that no one can tell how the violence actually erupted. Clashes between army soldiers and Cabinet protesters wound down Saturday morning as the army forcefully dispersed the roughly three-week-long sit-in at the Cabinet headquarters. Army soldiers surrounded Cabinet headquarters with barricades and barbed wire to block protesters' attempts to return to the Cabinet. The army also seized control of Tahrir Square. Hundreds of protesters gathered Saturday morning around the Cabinet headquarters and attempted to set fire to part of the building, some of which were arrested. Army soldiers, late Thursday night, attacked hundreds of protesters who were staging a sit-in in front of the Cabinet headquarters against the military appointment of Kamal El-Ganzouri as the new prime minister in early December. Essam Sharaf had been leading the interim government after Egypt's January 25 revolution, but resigned after the police attacked a peaceful sit-in of only tens demanding retribution for injuries or the death of their loved ones during the revolution. The incident flared as activists and Egyptians stood up for their right to protest and against the attacks on the small band of protesters. Five days of clashes ensued between protesters and police and army forces starting 19 November in Mohamed Mahmoud Square near Tahrir. These changes were foretold by the﻿ ancient Jewish prophet Daniel 2500 years ago. In Daniel 11:40-43, the Jewish prophet revealed the activities of all three Israeli neighbors: Syria, Jordan, and Egypt for the last days. Syria, referred to as the King of the North in verse 40, will make the first move against Israel. Jordan, mentioned as Ammon, Moab, and Edom in verse 41, will provide protection for the Jewish people, Isaiah 63. Egypt, found in Daniel 11:42-43, will join Syria to try and destroy the Jewish state. Truly, unrest in the Middle East is setting the stage for Bible prophecy to be fulfilled.